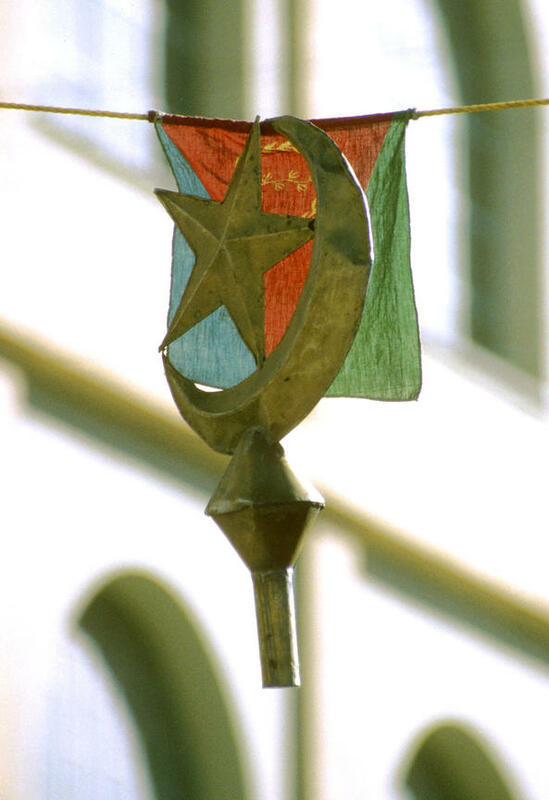 Sami Sallinen | Photo: Sami Sallinen.February 1998..The Islamic symbols of the star and crescent grip the Eritrean flag after a flagpole is accidentally caught on decorations erected for Eid celebrations in the Eritrean capital Asmara. Preventing the rise of political Islam has been one of the main preoccupations of the Eritrean government since the country's formal independence in 1993. Eritrea's population is equally divided between Muslims and Christians. The government formed by the Eritrean Peoples Liberation Front (EPLF - since renamed the Peoples Front for Democracy and Justice, PFDJ) has not allowed the formation of any opposition for fear of religious- or ethnic-based parties. Photo: Sami Sallinen.February 1998..The Islamic symbols of the star and crescent grip the Eritrean flag after a flagpole is accidentally caught on decorations erected for Eid celebrations in the Eritrean capital Asmara. Preventing the rise of political Islam has been one of the main preoccupations of the Eritrean government since the country's formal independence in 1993. Eritrea's population is equally divided between Muslims and Christians. The government formed by the Eritrean Peoples Liberation Front (EPLF - since renamed the Peoples Front for Democracy and Justice, PFDJ) has not allowed the formation of any opposition for fear of religious- or ethnic-based parties.